In this lesson, Sheila shares her vast knowledge on various cake flavourings and the ingredients used. Not only that, but she explains the different methods and quantities to use for each. Sheila takes us through some citrus flavours including orange, lemon and lime as well as coffee and chocolate. Now Sheila introduces us to a variety of different vanilla flavourings used for cakes, biscuits and other delicious baked goods. She shares some very helpful insights on which she feels are of the highest quality as well as the most cost effective. In this lesson, Sheila shares some more useful tips on different sugar syrup flavours, her preferred ones and the quantities to use for the perfect result. Sheila talks us through the main differences between butter and margarine when baking cakes and the pros and cons of each. If you have been subject to the famous myth about margarine being one molecule away from being a plastic click here to be enlightened. Sheila tells us all about various butter cream flavourings she uses along with some wise tips and information on quantities. In this lesson, she mentions her mint cream recipe which she has kindly shared with us and is available for download here or from the Ingredients tab above. 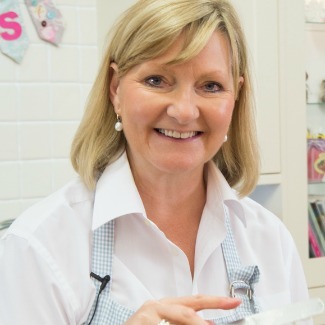 Sheila Jones shares her award-winning recipes with us as well as top tips on delicious flavourings and fillings. If you're a keen baker and looking for ideas for some tasty new flavours, this one's for you!